Play as Jack the Pirate. 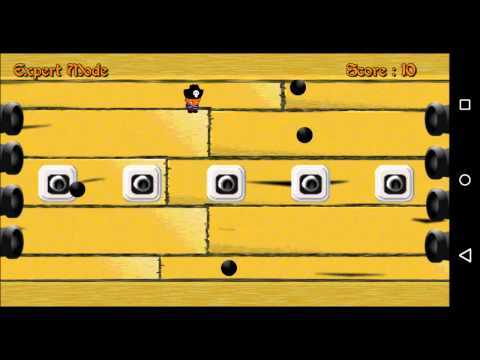 Jack is targeted by cannons, and you must help Jack to avoid all the cannonballs. the higher the score you get. Jack always move up and down, and you can't control Jack vertically. That's where the difficulties is. You can only control Jack horizontally, yet must avoid all the cannonballs. To control Jack is very simple.Tap on the left part of screen, and Jack will move left. Tap on the right of the screen, and Jack will move right. Control Jack correctly so he manage to avoid all of the cannon balls! so it will be easier to dodge. Cannon balls will randomly came from left or right side. pull the cannon ball down or pull the cannon ball up, which make it harder to dodge. came from both sides (left and right) on a short interval and make it more harder to dodge. In this game, there are 8 achievement you can achieve in total. You can achieve those achievement by getting the scores needed in the specific Game Level. Psst, but it's a secret, if you can achieve all of the achievement, you will unlock something in the game! If you managed it to get high scores, you must be proud and want to show-off your score to your friends. That's what the share button is for. Just one touch, you can share your score with your friend, via Line, Twitter, Facebook, and many more. LEVELS: 3 Levels available for playing.